A few weeks ago someone asked me how researchers were able to create ‘designer’ animals with bits of their genetic code removed. It sounds like something from science fiction! We call these animals ‘knockouts’ and since the technique was first developed in mice, I will explain it using mice. The mice are known as ‘knockout mice’, because the gene of interest is ‘knocked out’ of the genome. It is a technique we frequently take for granted in the life sciences now, because knockout mice exist in the thousands, as model systems for studying the genetics of various diseases in the laboratory. There are knockout mice for cancer, obesity, diabetes, heart disease, addiction etc. The technique is so important that the discoverers won the Nobel Prize for it in 2007. But how do you make a knockout mouse? We start at the beginning, both literally and figuratively, with Embryonic Stem Cells (ES cells). These are ‘blank canvases’; the technical term is ‘pluripotent’. Pluripotent means each cell has the potential to form any type of cell found in the body. Because they are pluripotent, they can, with the right signals, form heart cells, lung cells, neurons, skin cells etc. ES cells are special because they are pluripotent, and because they can replicate indefinitely. Most adult cells stop once they reach a certain number of cell divisions, but ES cells have no such constraints. ES cells are found inside the early embryo, while the embryo is still only several days old and looks like a tiny ball of cells. The discovery of ES cells in mice in 1981, published in a seminal Nature paper, was pivotal to our knockout mouse, which was to follow less than a decade later. 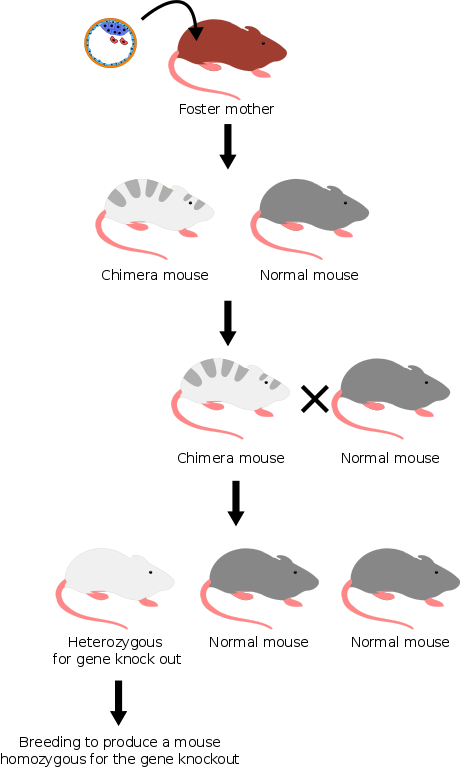 Given that ES cells isolated from a very early stage mouse embryo can then go on to make an adult mouse, the next logical step was to look at whether ES cells could be used as a ‘vehicle’, or a trojan horse, to sneak in a modified gene to make the adult mouse with a modified gene. Think of it as substituting one section of the blueprint for a car with a different design so that the finished car does not have a glove compartment. However, this is only useful if the design substitution would affect all the finished cars ever made in that production line, not just the prototype! So it is important to achieve something known as ‘successful germline transmission’. To move back from designer cars to designer mice, it wouldn’t be enough to substitute the modified gene into the embryo to develop into a designer mouse; the modified gene would need to be inherited by the next generation of baby mice. How can this be done? 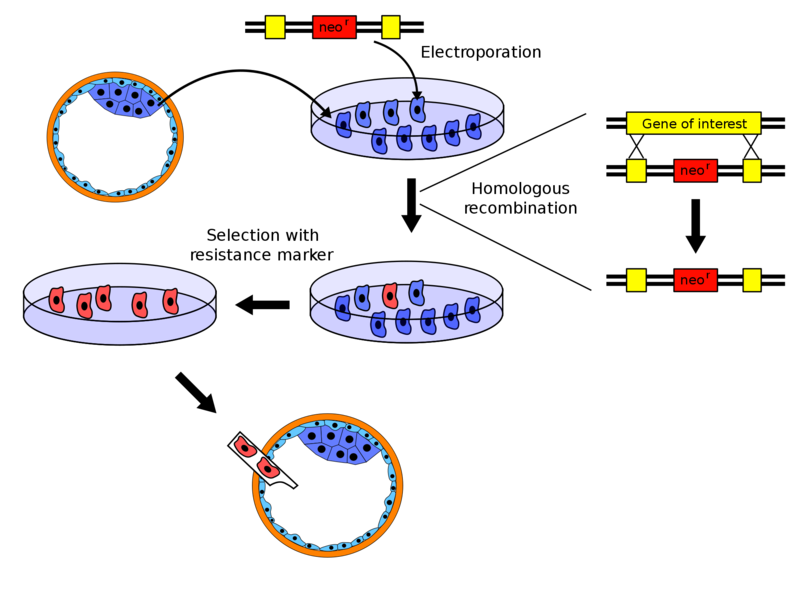 The germline cells are cells that are passed down to the offspring; for example, sperm and egg cells are germline cells. Therefore any modifications to the germline can be passed on to the next generation as well. Just a few short years later in 1986, another famous Nature paper was published in which scientists managed to do just that. First they infected ES cells with a virus to introduce foreign DNA into the cells, and then injected these ES cells into an early donor embryo, and showed that they could indeed introduce foreign DNA into the mouse germline. It’s great to be able to introduce viral DNA into ES cells, but designer mice means we want to be able to create mice with a specific mouse gene ‘knocked out’. The problem is that when foreign DNA integrates with the germline, it happens at random. This lack of precision is problematic, and therefore its usefulness was limited. Clearly, a better method for introducing foreign DNA into the germline with precision was needed. Luckily, such a mechanism, known as homologous recombination already existed in egg and sperm cells! Microinjection into a mouse embryo. Image credit: Stowers Institute for Medical Research. The process of homologous recombination happens during meiosis, a special type of cell division that egg and sperm cells undergo. The best way to envision homologous recombination is to think of two similar books; Book A and Book B. Both have a similar number of pages but the stories are completely different. Now imagine tearing out pages 13-55 from both books and substituting the pages from Book A into Book B and vice versa. The books still have the same outward appearance, and the page numbers still make sense, but the stories are now jumbled up. When inserting the foreign pages of Book A into Book B, it is necessary to refer to the page numbers of the neighbor regions 12 and 56. Moving back from book desecration to designer mice, scientists discovered that they could harness this process of homologous recombination to introduce a foreign, mutated DNA sequence into the precise location of the same DNA sequence in the recipient cell’s genome. 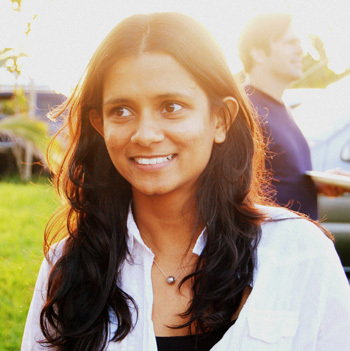 As a bonus, the scientists also added a resistance gene for the antibiotic neomycin along with the mutated DNA, so that any cells that had successfully taken in the foreign DNA would be able to grow in the presence of neomycin; cells that hadn’t taken up DNA would automatically die in the presence of the antibiotic. This work was published in yet another famous Cell paper, in 1987. Procedure for preparing embryonic stem cells (ES cells) with modified gene for injection into mouse embryo. Image credit: Wikipedia Commons. Click to view large. Everything was now lined up to create the designer knockout mouse. 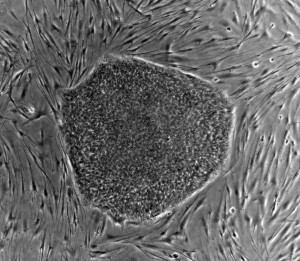 To recap, scientists were able to isolate the all important embryonic stem cells that are able to differentiate into all the different cell types necessary to form a complete animal. They were also able to use these ES cells as a vehicle to introduce foreign DNA into a donor embryo which developed into an animal. Finally, using homologous recombination, they were able to make sure that the foreign DNA was introduced to the precise, correct location within the germline, so that the foreign DNA was inherited by the subsequent generations of mice. We’re almost there, but first it’s important to cover some basic Mendelian genetics. A chimera (mosaic) mouse is a single animal that has cells from two different embryos. At this point, in order to avoid confusion, it is helpful to think of all the different mice we’ve encountered in terms of coat color. So let’s imagine that the ES cells were isolated from a white mouse, and their DNA modified and injected into a donor embryo from a grey mouse. Breeding a knockout mouse. Image credit: Wikipedia Commons. This donor embryo now contains two types of cells – modified ES cells from the white mouse, and also the original cells from the grey mouse. 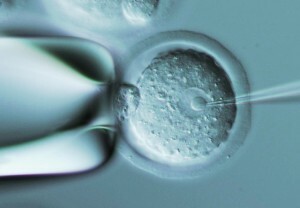 Therefore, this donor embryo is now a chimera embryo. It is now implanted in the uterus of a foster mother (let’s imagine she’s a brown mouse). She would eventually give birth to baby mice that are either grey (the original cells) or grey mixed with white (chimera mice). The chimera mouse is then mated with a grey mouse, and the offspring from that union would be either completely white, or completely grey. The completely white mice are known as heterozygous for the gene knockout, and the completely grey mice are just normal mice we aren’t interested in. If necessary, it is possible to mate two white mice with each other to produce baby mice that are homozygous for the modified gene we are interested in. And we’re finally here! So here is a guide on how to make a knockout mouse. Prepare your foreign modified gene which is very similar to the original gene you want to knock out. Make sure that the neighbor DNA region is similar to the original (i.e. ‘page numbers’ from the flanking neighbor region should match). Also add an antibiotic resistance gene to this construct. 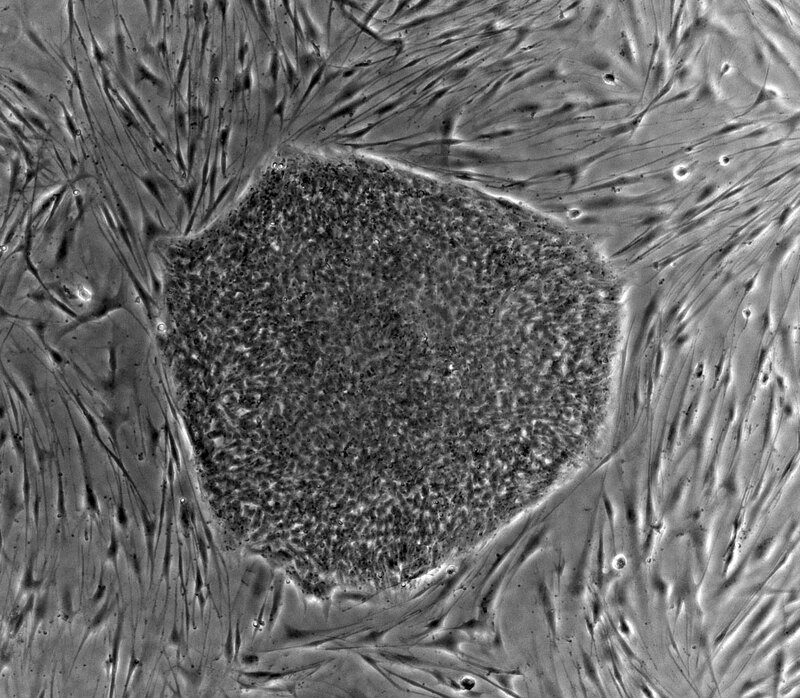 Isolate embryonic stem cells from an early mouse embryo (white mouse). Culture these cells on a petri dish to grow them up a bit more. Introduce the modified DNA construct from step 1 into these ES cells by zapping them with a tiny current of electricity, a technique known as electroporation. Grow the zapped ES cells in the presence of the antibiotic to select the cells that have successfully taken in the modified DNA construct. The surviving cells are now a pure population of targeted ES cells. Inject these targeted ES cells into early mouse embryos, i.e. the donor embryos (grey mouse). These embryos are implanted into the uterus of foster mothers (brown mice). The foster mothers give birth to either chimera mice or normal mice. Chimera mice would be grey + white, while normal mice from the donor embryo would be grey. Mate a chimera mouse (grey + white) with a normal mouse (grey). The baby mice would either be completely white, or completely grey. The completely white mice are heterozygous for the knockout gene, meaning they are missing one copy of the gene of interest. If necessary to obtain mice homozygous for the knockout gene, mate two white heterozygous mice with each other. The babies from this mating would still be white, but will be missing both copies of the gene of interest. For a really good diagram explaining this process, you can check out this illustration at the Nobel Prize Website. Fascinatingly, an International Knockout Mouse Consortium was formed in 2007, with the ambitious goal of creating a gene knockout for every single gene in the mouse genome. As of 2011, it was reported that about 17,000 have been already disabled with roughly 3,000 more to go. The ES cells are available for purchase at The International Knockout Mouse Consortium website. At the time of writing, a vial of ES cells that carry a knockout gene costs $1470. It is also possible to purchase a ‘conditional knockout’ for some genes, which allows scientists to disrupt that gene in a living mouse at any body site at any point in development by adding specific enzymes that are recognized by the modified DNA; the modified DNA lies dormant inside the mouse until the addition of the enzymes which activate it, to knockout the gene. This means the scientists can study the effects of even ‘embryonic lethal’ genes; genes that are so important in development that knocking them out in early development would kill the embryo. Finally, it is possible to directly buy your knockout mouse of choice from the Jackson Laboratory, where they have a full catalog of mice for sale that you can search for by entering your research area (cancer, immunology, diabetes, heart disease and so on). Knockout mice have been an invaluable tool for researchers to study diseases. Until the advent of the knockout mouse, we had no way of testing the function of different genes – to understand the function of a gene by removing it and then seeing the effects are useful. Imagine you have a car, and you want to learn the function of the different parts. If you remove (or knockout!) a wheel, the car cannot move. Therefore you can conclude that the wheel is necessary for motion. By being able to target candidate genes, it is possible to formally establish the link between a gene and a disease. By being able to study a disease in a model, we can understand it better and find treatments and cures for that disease. 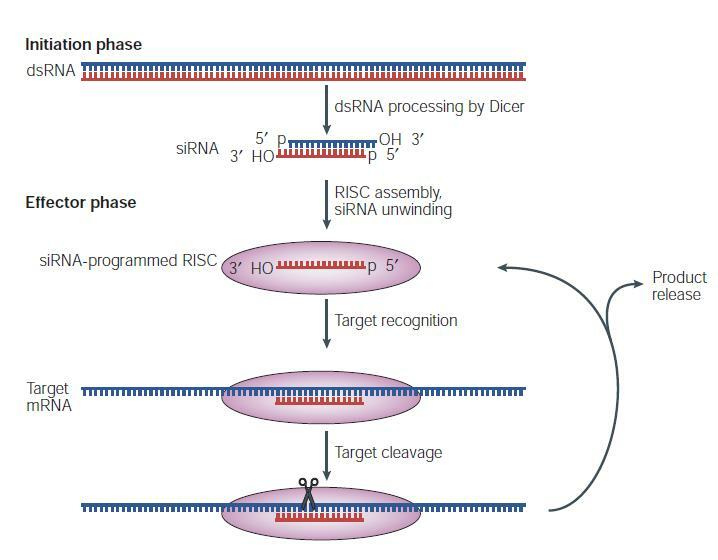 This is a slightly more advanced summary of Gene Targeting from the Nobel Prize website.